Tomorrow morning, shortly after 9 a.m. the Douglas County Commissioners will deliberate about and decide at least two of the open seats for HADCO Board of Commissioners. CEA has already endorsed Joy Mayorga to fill one of the seats. We have also set out why we do not want Jim Smalley to be appointed. This post is dealing with why we do not want Shannon Gammie on the HADCO Board of Commissioners. Instead of going into a story here, we just posted the email and some attachments CEA sent to the DC Commissioners. In a prior email, I mentioned what CEA has some information about an application for HADCO Commission, Shannon Gammie that we believe should be considered regarding her candidacy. This email contains a few points regarding Ms. Gammie that we believe are important, but we are particularly concerned about a recent court case she was involved in when she was working as a property manager for Umpqua Community Development Corporation (UCDC). Attached to this email are two documents that provide information CEA believes puts into doubt whether Shannon Gammie should be appointed to the HADCO Board of Commissioners. They show that Ms. Gammie misrepresented information to a judge, which resulted in a judgment for eviction against a young mother and her children. This was done when Ms. Gammie worked for her prior employer Umpqua Community Development Corporation (UCDC) as a property manager. According to Douglas County Circuit Court records, the tenant went through a court eviction case with UCDC that got settled in court. The settlement was based upon the tenant/defendant making payment to UCDC/landlord/plaintiff by a specific date. The defendant dropped off a check to cover the required payment, which was accepted by the landlord UCDC. A copy of the check is attached. 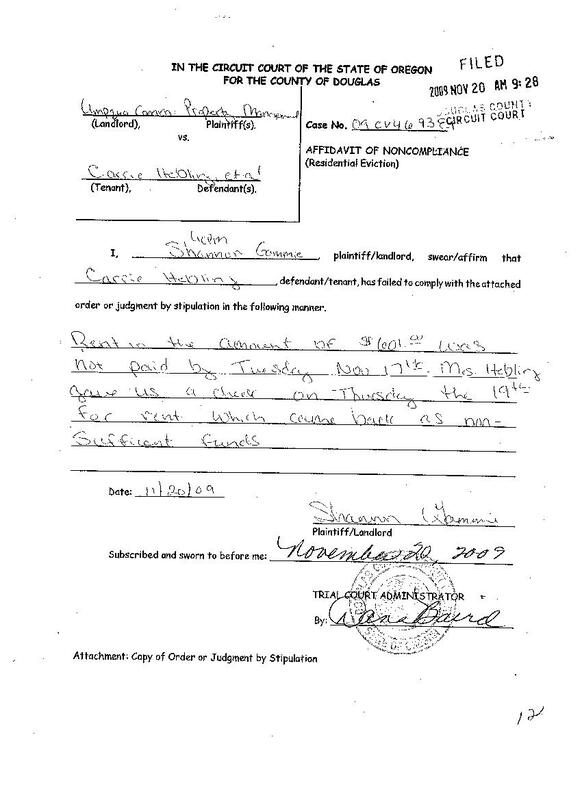 A couple of days later, on November 20, 2009, Ms. Gammie wrote and signed the attached declaration claiming that the check given to UCDC from the tenant/defendant was returned from the bank NSF. As you can see from the attached documents, this was not true because on that very same day the check was paid by the defendant/tenants bank. So it seems that although there was no check returned NSF, Ms. Gammie claimed in a court document that there was. CEA learned about his a case a couple of months ago, when the young mother came to us for help. Except referring her to an attorney, there was not much we could do to help her, but she wanted you to know about this situation because Ms. Gammie had applied to serve on the public housing authority board. Although CEA believes that this information , which is supported by written documentation, is sufficient to reject Shannon Gammie’s application, there is some additional information that you might want to consider. It is our understanding that Ms. Gammie no longer works for UCDC. So any benefit she would provide because she was employed with UCDC at the time she applied to be on the HADCO board no longer exists because she no longer works for them. Lastly, CEA has information that Ms. Gammie and HADCO’s current executive director are personal friends. Also attached to this email is information from Ms. Newman’s internet social networking site Facebook. It shows Ms. Gammie on Ms. Newman’s friends list. Given the issues going on with HADCO, it might be very unwise to put someone in the position of HADCO Commissioner who has a personal friendship with the ED. Even though this alone might not be a reason to reject Ms. Gammie, it is something that should be carefully scrutinized. Given the totally of the circumstances CEA believes that Ms. Gammie should be rejected as a candidate for HADCO Commissioners. We hope you agree. One of the attachments to this email is a copy of what we copied and pasted from Dolly Newman’s Facebook page showing Shannon Gammie is on her friends list. You can access this information my doing a search for Dolly Newman on facebook. Two of the other documents were scanned by me from a document the tenant gave me and from one I got a copy of at the Douglas County Circuit Court Clerk’s office. Dolly Newman Facebook Friends you can check this out by going to facebook.com and looking for Dolly Newman. Note: We have temporarily removed the full copy of he check and the bank information showing the check cashed by the bank not returned NSF. We did this to redact some of the information due to a comment we received that made us rethink posting the whole thing even though the entire document is a matter of public record anyway. Also to the person concerned about CEA posting the information, please be aware that this was done with the person’s full understanding of potential consequences and written consent. A bank account can be changed a bit more easily than what has been done to her family. However, we do not need it here to really prove the point, so we decided to remove that information and will repost it after we do. Previous Post CEA Asks County to Take Over HADCO!